These last couple of months of 2009, particularly the last month (December) has been pretty much rockbottom so far of my life. Nothing has gone right…I am in a constant state of looking for something that is out of reach. I don't even know what I'm looking for, which makes it harder to find. But this subject will be in a next blog. I'll get to that later. I want to Learn Chinese!! I actually want to learn every language (at least 10) and Chinese has always fascinated me, so good place to start. I know a lot of Spanish and a tid bit of French, but I'm ready to take on China. And Sign Language is a very close second. I need to continue my weight loss regimen, so I guess this is and isn't a "resolution". Its been a rocky road in terms of losing weight but at least it's a road at all and best I can do with the new year is to keep trying. I need to be 20 pounds less by next year! I need to keep better control of my finances…big time. Its not that I spend a lot of money, but the money I do spend I spend without keeping track of and then I get my bills…and I just feel out of control. I don't know where any of it possibly went. But I guess that's a typical part of life…but I have to try. It will never be perfect, but I need some sort of system…any ideas? I need to stop biting my stupid fingernails!!!!! Enough said. I need to do a heck of a lot better in my studies. I haven't been good enough. Have to keep trying. Med surg is coming this spring, and it will be the hardest class yet. I have to put every ounce of effort I possibly have into this course. I need to focus on being happier with living in my skin. I have been very on edge lately and I can't place why. But that's another blog, like I said. I want to read more!! And paint more!! (Summer activities). I need to keep my room clean as I can. I need to keep my car as clean as I can!! It makes me sad to drive it. This post will be about a lot of things I've saved up to say, but mainly about one issue in particular. So I have this patient that has brain cancer, and multiple brain tumors. As an aide, I really don't know many details at all, except that she has been stuck in bed for 25+ years because of brain surgery gone wrong 25+ years ago. They hit a wrong nerve or something I suppose...Like I said, I don't know all the details. Her appearance is....ghastly. She is in her 60s and is bald, with maybe a couple strands on each side that stick up behind her head like horns. SHe has sores all over her head (I'm not sure why). But she does have pretty eyes. Now, I know for a fact that although it may be true that she suffered some brain damage, I know she can definitely hear what we are saying, and she will sometimes even respond. She watches everything that is going on around her and I can tell she is processing information. There have been multiple occaisons where she smiled to something I said or after having had her for over 2 weeks and gaining her trust, she will smile when I walk in room. She can sometimes also answer "Yes" or shake her head no when asked a yes or no question. Now the issue is her husband. At first I thought I was witnessing worlds best marriage. Her husband comes in every single day and spends a couple hours at her bedside. When I walk in on the two of them he says things like "She gets more and more beautiful every day, doesnt she?" I respond with "Yes." with a smile. He responds back with "No really, she really does. Every day. She's just gorgeous." He also talks to her, tells her everything about his day. He tells me about her past, how she used to be the sweetest woman he ever met, how pretty she was. She had a doctorate in education, she taught young kids...He tells me how they had 25 years of a blissful marriage, how she never spoke a word or ever made any argument. She wouldn't hurt a fly. At first I thought this was sweet...borderline very sad, kinda creepy...kinda not-human like. But I didnt think much further on it. Last night, her nurse however asked me if she puts up the same reaction when I go near her, how she acts very scared. Her eyes look scared when ever you touch her or go near her. She tenses her body up (her arms at least, her legs dont move) and she sort of will try and pull away from you. I told the nurse that yes, she used to do that to me but now she trusts me and all you have to do is explain you wont hurt her and what you are doing. We both started to wonder why it is she feels scared. There is most likely a logical reason. She did spend quite some time in our local nursing home. Did something happen there, repeatedley? Is her husband doing some sort of emotional or physical abuse, or neglect? She was under his care for a good 10 ten years, and she was forced to go to hospital/ nursing home because she was neglected in terms of horrible bed sores. The interesting part is when we tell the husband she has to go to back to the nursing home from now on. He insists she come back with him...but we had to wait for him to get his new apartment so it would be 2 weeks, and we can't hold her for two more weeks. He starts getting very angry saying how this is a "conspiracy" against him and her that we dont let her go back with him. But really, he can barely walk, how is he going to take care of her? Turn her? Prevent her from getting more sores? She needs to realistically be in a nursing home, but he cant see it. He doesnt see her for what she is right now...he is seeing 30-50 years ago. . . Also, they mentioned that this situation often happens because the spouse wants to collect that persons SS, so they will elect to keep them living in a house rather than a nursing home, where the nursing home gets the SS....Interesting thought. It just worries me. Is she screaming inside when he comes around? She can't say phrases. She never screams. But I know she's in there....And i know this sort of stuff happens. I just wish I knew and wish he would realize he is not suited to take care of her any longer. Will write more soon, but currently on the run. Yesterday I spent 4 hours with a patient that wanted to commit suicide. At first I was afraid to go in there because I had heard that once you went in, she wouldnt "let" you leave. But, when I am in the hallway and someone like this is ringing, I cannot not go in to help. Sure enough, she starts telling me about why she has been admitted to the hospital and that she might never walk the same again...and she is normally very athletic. She said more than once to me, that she would rather die then go on one more day like this. Now, in nursing school, we have had countless lectures in "therapeutic communication" and what to say and what not to say but when put up in front with a patient that is confiding in you all this very personal information about her life, and bawling her eyes out, I am speechless of course. I am not the type of person to come up with countless corny phrases that these people don't want to hear. "It'll be OK." "This too will pass" "You'll get better soon" "don't lose faith"....they've heard it a thousand times from people like me who are also speechless and come up with the first line in the book and duck out of there. I am also not the person that can just leave people alone that are like this. So here I am in this awkward position where I am sitting there thinking of something to say as she tells me her life story and is crying her eyes out. I hand her a tissue box. I hold her hand...She gives me hugs. She apologizes...I say not to. What else can I do? I definitely do not feel I am the right person for this...I don't know what to say to people that do not want to continue living there life. I firmly believe that if someone is truly that miserable, then who are we (doctors, nurses, parents, friends, etc.) to stop them? The best we can do is be there as a light at the end and offer our hand in help. But putting them in a psych ward to be babysat so they don't kill themselves? Seriously? I cannot offer words to tell people why life is worth living...Because I don't know why. I am 21 and haven't yet found this reason. I have my own reasons why I continue on, as everyone else. I am not nor ever would be afraid to die, but I know that when I do die, I pray that I will have at least published a novel first...Thats why I live my life...To write...to do photography...to change peoples lives. I desperately want to be the "hero" nurse that can change peoples lives like my patients yesterday. I want to say the right things...I want them to feel better. But I am petrified that they can see right through me...can they? I give 1000,0000, 000 props and kudos to the volunteers that work at those suicide hotlines that can stay on the phone with people for 3+ hours and convince them not to kill themselves. They are heroes. I have only ever done a small amount of research on Alzheimer's disease...That is, research at the computer and through books. But I have been graced with the *delight* of working with anywhere between 5-15 people each shift who suffer some form of dementia. And that number is out of ~30 patients each shift. Some people love working with these patients. Frankly, I hate it. I don't mean to sound like i hate my patients, but the work is hard. I think particular nurses that like doing this are afraid. They are afraid of working with people with 100% of their mind. Maybe they are afraid of normal human contact and would prefer to come to work and not be judged by their patients. Or maybe they just have a bigger heart than the rest of us and don't mind if their patients aren't able to appreciate or remember it. I need to be able to build relationships with my patients. Thats just who I am. I need to be able to carry out a normal, civilized conversation without being punched, swatted at, growled at, etc. I understand these people are confused out of their right mind, they have no idea where they are and how they got there. I would probably try to punch a bunch of strange people in white scrubs if i didnt know where I was and they were trying to do things to/with me. Thats understandable....but it's still not my preferred area of work. Is that so bad? That even though i accept my future role as a nurse, I still hate a big portion of it? I just pray, every single night, that one day I will find a job that I love...Truly love. I don't care if it has long hours and I am exhausted...I dont care about any of that if I can look forward to going to work, seeing my patients, seeing my coworkers and not dreading the entire thing. I firmly believe that if you are not *remotely* happy at your job, you have no shot at being happy in the rest of your life. Hopefully I'm wrong. Sure, you could still have a great spouse and wonderful children you love to come to, but a job you hate will eventually tear you apart and bring you down, and there is no way for that to not affect the rest of your life. I accept the fact that it is impossible (nearly) to get a job at 21 that I will love. Ok, i get it, I have to work my way up there. But if the rest of my life is like this...I dont know what to do next. . . The Awkward First official Blog Post! Well, this is my first blog, officially. I have always had mixed feelings about having a blog for everyone to read- mainly because I don't need certain people reading things and interpreting things wrong. But I love having a place to vent and I am doing this so hopefully people can relate, and i can relate to them. First off, I would like to say a couple of things of how this blog is gonna go down: (Wow, that was dorky- I apologize). 1. I want this blog to be a lot about my new found allergy- Gluten! Read more later. Very interesting. I am learning a TON about it, and its a hard but rewarding life. Hopefully I can find others that I can help too. 2. I want this blog to be about its Title! 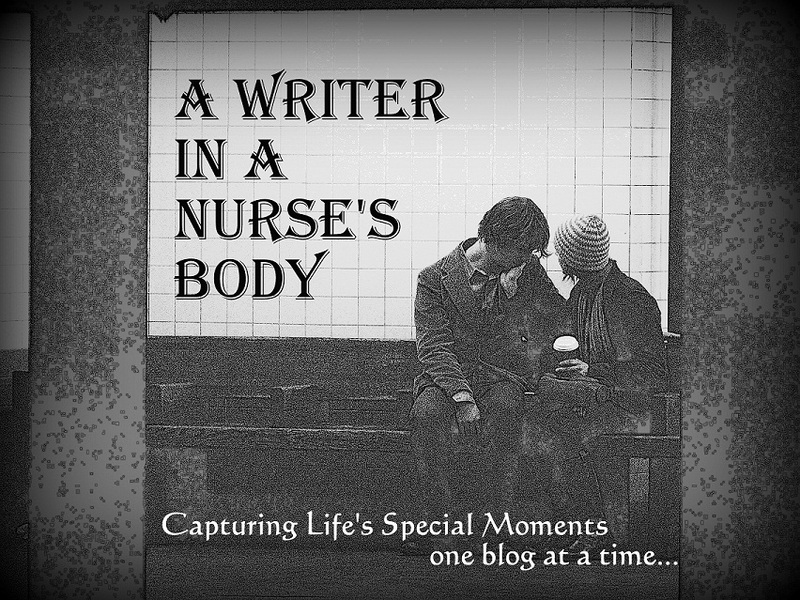 "A Writer in a Nurse's Body". Writing (and Photography- but more so writing) are my passions, among a couple others (like drawing, animation, painting). They make me SO happy. Most people know that I am majoring in college for Nursing....so to say, my "safe" route. You'll hear a lot about that on this blog. 3. Miscellaneous! Things that make me happy...random things, random stories...random facts....Whatevers. It shall be a daily surprise. 4. I want to *try* to end every blog with either a matching photograph, or just a pretty one in general....And always one of my own!